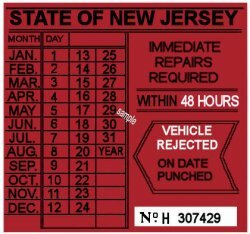 00 New Jersey FAILED REJECTION Sticker 48 Hrs 1970s - $20.00 : Bob Hoyts Classic Inspection Stickers, Add a Final Touch to your Restoration! This NJ Rejection sticker gave the unfortunate owner of a failed inspection only 48 hours to repair their seriously impaired vehicle. This stcker existed in NJ from the early 80's. Because of it's enormous popularity, we have removed the years from it so it will fit all year Rat Rods and custom machines and those who want something different. This sticker has been digitally restored and reproduced slightly smaller than the original which was very large. It is otherwise identical in color and detail both front and back. It has our patented "Peel and Stick" format to allow attaching to the inside drivers side of your windshield.